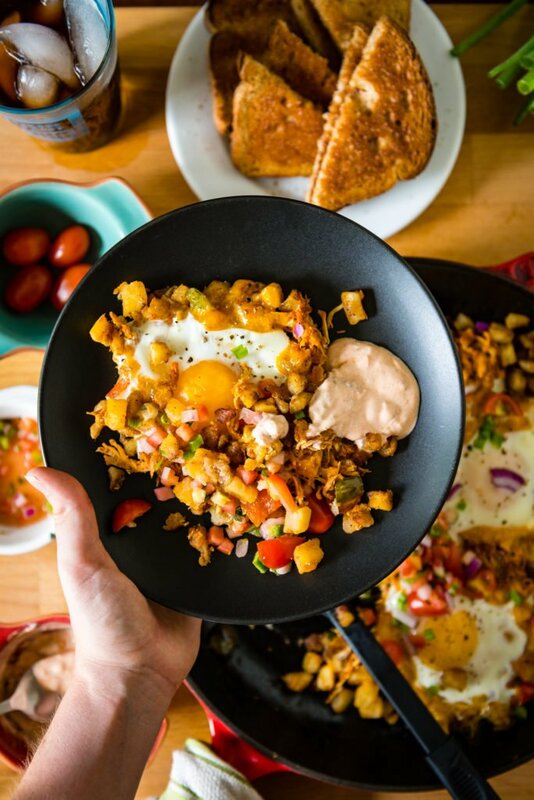 Sucker for a great brunch recipe? Me too. 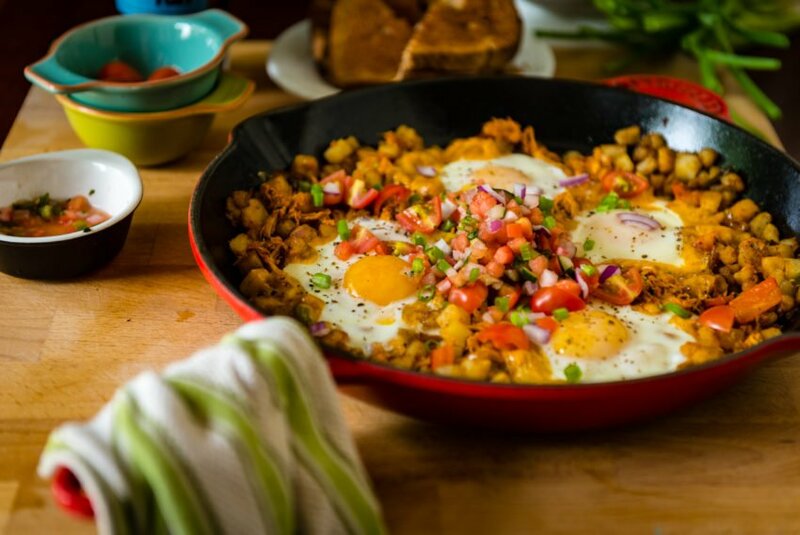 This Spicy Chipotle Breakfast Hash is quick, easy and cheap. Perfect for a lazy weekend. In collaboration with Idaho Potatoes. I love a new fresh menu every night as much as the next inspired food junkie, but every now and then, all I want to do is sink into the familiarity of family recipes and comfort food. I had some leftover pulled chicken, tossed in our families top-secret barbecue sauce that I wanted to use up. (Read: Sit and eat right out of the container with my hands). Since weekends are made for brunch, I got to dicing a couple of potatoes and seeing where inspiration led. I started by grabbing some meats, a smokey kielbasa, and some breakfast sausages to fry, but spotting that container of smokey pulled chicken, I tossed those back in the fridge for another day and got to work. 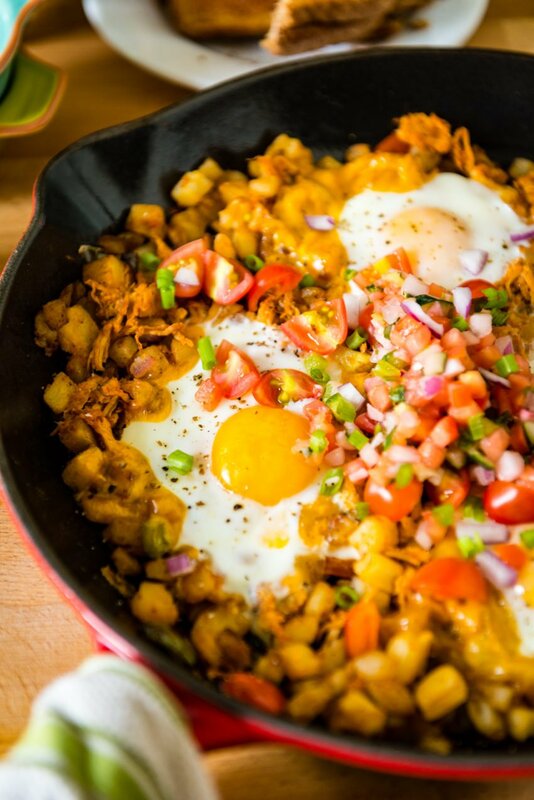 Like magic, Spicy Chipotle Breakfast Hash came to be. Just a few diced potatoes, leftover chicken, spices and bits of leftover produce brought this brunch together. It probably cost $2.00 with the eggs, cheese, and potatoes combined (the cheese being the luxury there) and came together quick, with sauteing the potatoes and waiting for the eggs to set in the oven being the moments where I was salivating just debating nibbling on an extra slice of bacon. It was worth the wait. Every single bite of it. 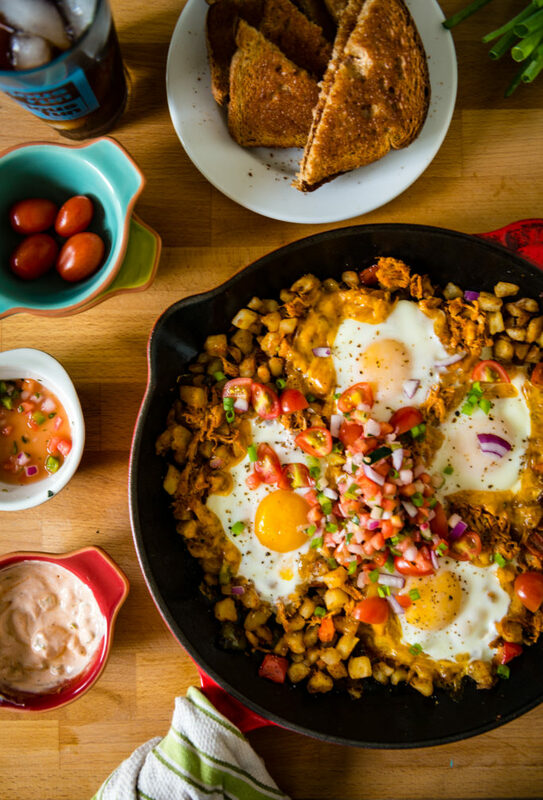 Raid the fridge and let’s whip up Spicy Chipotle Breakfast Hash. Peel and dice your potatoes into 1/2" cubes. Preheat a large oven-safe skillet over medium high heat. Add butter and swirl to coat. Toss in the potatoes and season with salt. Allow the potatoes to brown in the skillet while you dice the rest of your vegetables, 10 minues. Saute the potatoes until they are just starting to crisp. Toss in the onion and peppers and season with salt and pepper. Stir to combine and allow the veggies to get tender, another 5 to 7 minutes, stirring as needed (you may need to toss in another tablespoon of butter). Add the paprika, cumin, and cayenne and stir to coat. Allow the potatoes to really brown before removing from heat. Stir in the leftover chicken and mix to combine. With your spatula, create 4 divots in the potatoes. Working quickly, arrange the cheese in each divot, creating a little nest for each egg. Gently crack an egg into each. Slide into the oven and bake for 14-16 minutes until eggs are set. Pro tip - I always pull my skillet out of the oven a minute early. With all that heat, the eggs will continue to set as I garnish the dish and set the plates out (but I do love a runny yolk). Meanwhile, make the chipotle cream. Whisk the sour cream (or crema) with 1 tablespoon of chipotle sauce. Taste and add more if desired. Season with salt and pepper and whisk in the scallions. Garnish the skillet with fresh tomatoes, pico de gallo, scallions, and fresh snipped cilantro, if you have it on hand. Serve directly from the skillet. I whipped this up in an oven safe skillet, perfect for 4 eggs, but if you are feeding a more, double up on your ingredients in the skillet and bake this in a 9x3 pan, cracking the eggs over the cheese right in the pan. Other great additions to this hash - fresh grilled corn right off the cob, black beans, and diced jalapeno. Pepper jack or Monterey Jack would be great substitutes for cheddar cheese in this recipe! Remember, it's a clean out the fridge meal - so grab what you got! We always make hash after holidays, from the leftovers. We need to make more hash! Now this is one bold breakfast! Love this for a Saturday morning fix when I’m just not feeling the typical pancake or waffle routine. Cannot wait to try this!